Eddie Daniels is perhaps best known for his six years playing a driving, swinging, contemporary jazz tenor with Thad and Mel. On this date, though he didn't bring his tenor at all but instead brought flute, alto flute, clarinet and bass clarinet. Those not yet familiar with Eddie's work on these instruments are in for a real treat. Bucky Pizzarelli's background and musical style is somewhat different. For a time he had a guitar duo with George Barnes, and has worked with many big bands. He possessed a wide range of musical experience and is equally adept at performing classical acoustic guitar as he is on his seven string electric guitar. Here he performs on the two. This project was first conceived as a duo album. 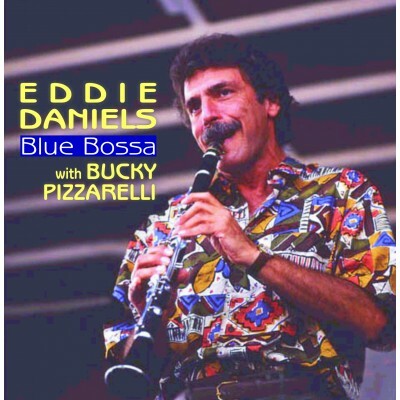 Bucky is a modest fellow though and from the beginning seemed to indicate that he thought this should be Eddie's album. This is an unusual combination of talent in which Eddie produces and endless flow of original creative musical ideas.